I think we can all agree that there is just NOT enough petite oriented options out there. Even if a major brand carries petite collections, it's only a limited number of pieces and tend to be hit or miss with sizing. I was excited to learn about about a new petite exclusive online shop called Zen Petite, which focuses on providing petite basic pieces that us 5'3" and under can count on. Michelle Abrams, the founder, has to mission to provide us petite with the modern basics of our dreams, which is something I can get behind. At a previous point in my life, I would have been underwhelmed by the idea of another store selling basics tees and bottoms. However, as you get older you understand how a great set of basics is basically the mitochondria of your wardrobe. The powerhouse pieces that you utilize more than you think. So far the price range at Zen Petite is between $25 to $50, which isn't too pricey considering Zen Petite is a boutique brand and how high quality the pieces I've gotten so far. Currently they have six pieces available, so I'm anticipating new collections as they come. I styled two looks for Zen Petite below and if you wanted to also try out some items, use my code 'ZARRINALAM' for 20% plus free shipping currently. The code is available until 7/7. 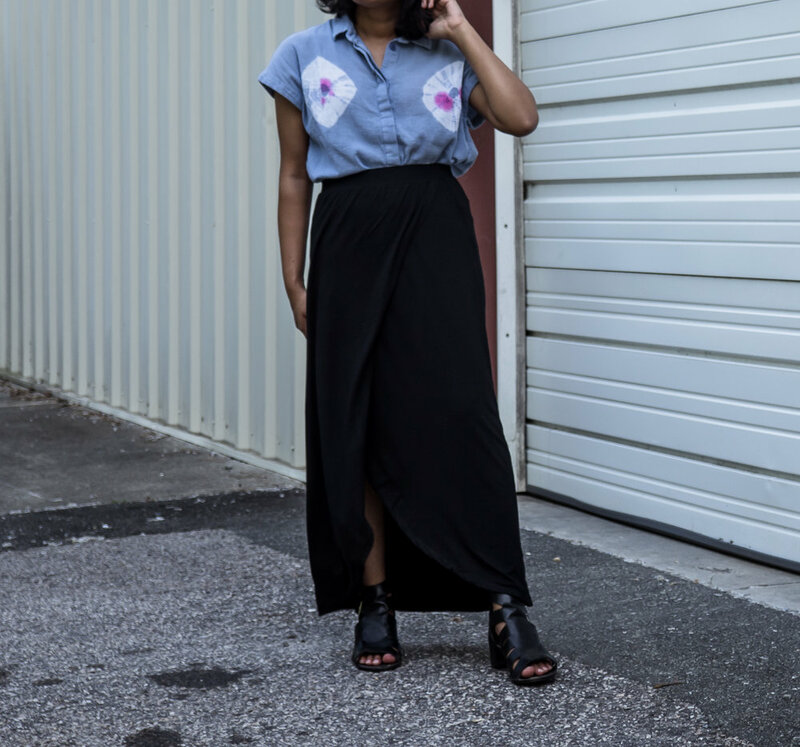 The first piece I styled is the petite tulip wrap maxi skirt in black. Can we say "hallelujah!" for a maxi skirt that finally doesn't drag on the floor?! Most petite collections are for 5'3" and under, but what does that even really mean for someone as short as me? I'm sooo under that, even petite maxi skirts are still too long. However, Zen Petite got the perfect length. I was pleasantly surprised by how versatile this skirt is and have worn it five times already. The fabric is a bit thick, but still light and very high quality. Reminds me of jersey fabric because of how soft it is. It's also an easy piece to style up or down. My favorite detail is the tulip wrap. At first glance, the skirt seems more conservative and column-like but as soon as you start walking that leg slit pops out. If you've got some cute shoes, those would really stand out with this skirt. My only issue currently is sitting down and accidentally flashing someone, since it's technically a wrap skirt there is a long opening in the front. I styled this with a bit of colored linen for a contemporary summer look. Added my striped boater hat and my gladiator style heels to go to an outdoor brunch. The second piece I tried from Zen Petite was the maxi tank dress in dark grey. This is one of those easy outfits where you don't want to try to look good, but it just happens since it's a one piece. It's also a great transitional day to night dress. I opted to go for a trendier look by throwing a linen blazer on top and my favorite black boater hat, which is perfect for day time look. Then I'm headed to an outdoor concert or bar hangs, I can take off the blazer for casual, but stylish look. Hopefully turn a few heads too, maybe. Though, as simple as it looks, the long side slits are what makes the dress. Zen Petite is killin' it with leg slit game. They know the tricks to give you that long silhouette. Also it gives me an excuse to wear gladiator style sandals and show them off. *I received these items for free as a part of a sponsored piece with Zen Petite. Thoughts and opinions are of my own.